Wired Women profiles successful women with ties to Boston who are pursuing their passions. These women serve as an inspiration not only to myself, but to women and girls everywhere who are eager to make waves in their field! 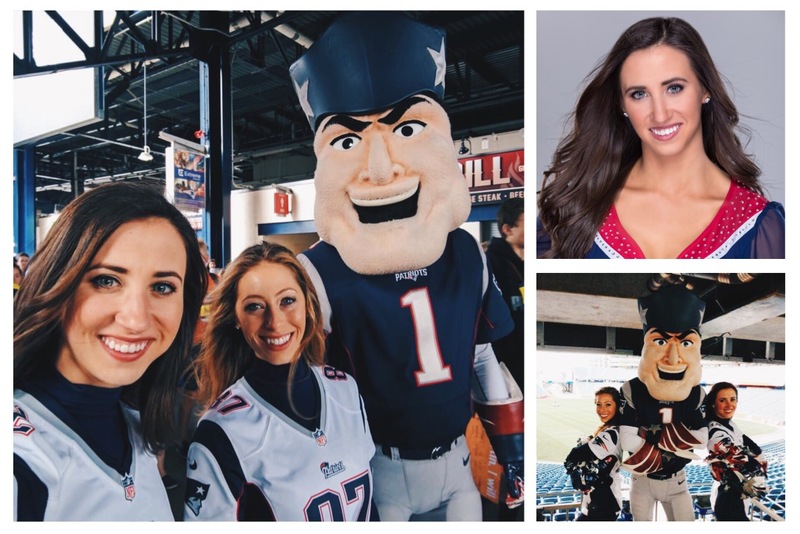 Meet Kelsey Zimmerer, a marketing professional and dedicated dancer who just joined the team as a New England Patriots Cheerleader. Read more about Kelsey below! Style-Wire: How old were you when you discovered your passion for dance? Kelsey Zimmerer: I began jazz and ballet classes at age 2, and since then have had many experiences that have strengthened my love of dance. In third grade when I started to take hip hop class, performing in my town's Nutcracker Ballet for 9 years, competing with my dance team in high school and college, and venturing into dancing at football and basketball games have all been such unique and inspiring opportunities that remind me why I love dancing and performing so much. That's to say I don't really have an "ah-ha" moment of when I realized my passion for dance, but I've had many opportunities that pushed me to grow as a dancer and made it a part of who I am. SW: You stuck to the books for college and majored in Journalism at NEU, how did that affect your dedication to dance? KZ: I've always had a busy schedule between dance and school plus other extracurriculars, and for me college was no different. I've found that having a busy schedule helps me to stay focused. Sometimes it was a lot to juggle, but it's helped me work on my time management skills and taught me to pursue goals in multiple areas of my life. SW: When you graduated did you feel pressure to venture into the "real world" and pursue a more typical career path or was dancing always in the cards for you? KZ: When I graduated from Northeastern I actually did pursue a career in marketing and still work at that job currently. I knew that I wanted to keep dancing after college but realized it's not the only passion I have and it's not easy to make a full time career out of dance. I also enjoy being creative, fashion and retail, photography and travel and wanted a career path that could include all of those interests (or at least some of them)! SW: When did the possibility of auditioning to be a Patriots cheerleader come about? KZ: Two of my coaches for the NU Dance Team at Northeastern were professional dancers in Boston, one for the Boston Celtics and the other for the New England Patriots. Having them as coaches and seeing their amazing experiences up close made me realize maybe I could do that too, but truthfully always thought it was way out of my league. At the end of my senior year, my coach who was a Patriots Cheerleader told me all about the audition process and kept assuring me that it was deffinitely something I could do. After about 4 months post-grad, I knew that even though having some free time was nice, I really missed being on a dance team and performing for sports fans. That's when I decided I needed to audition to be a Patriot's Cheerleader. SW: What was your rehearsal and training routine like leading up to the audition? KZ: I began preparing in November for the auditions in March. I focused most of my energy towards my physical fitness, my nutrition, and continuing to work on my dance technique. For me this included a lot of morning workouts and barre classes, learning how to eat a cleaner diet, and a ton of dance classes. As auditions got closer I started doing the workout program, BMAX, that our team trainer Andy Berler created and I researched everything I could about the team and the audition process. SW: How did you feel when you found out you made the team?! KZ: I was overwhelmed with joy! The audition process was 6 weeks long and started with nearly 500 women auditioning for an eventual 34 spots on the squad. When the team was finally announced at the last day of bootcamp in April, I could not believe it when my name was called. It was such a dream come true. SW: As an athlete on to go, nutrition is key- what are some of your favorite spots for a quick meal in the Boston area? KZ: Nutrition is very important, both to look and feel your best and to stay healthy with such a busy schedule! I work downtown so I frequent B.Good and Sweetgreen for lunch all the time, and I can't wait for Dig Inn to open soon. I'm also a huge fan of Life Alive in Central Square Cambridge. Their bowls are so nutritious and savory at the same time. SW: What's does a typical work day look like for you? KZ: Most weekdays I try to get my workout in before work because I like the energy and sense of accomplishment first thing in the morning. Then I head to work for the day in Downtown Boston where I do brand marketing and product merchandising for a local start-up. I typically practice dances and cheers or go to team practice at Gillette in the evening. After that I come home, hang out with my boyfriend and my roommates, cook dinner and meals for the next day, and go to bed! If I'm lucky I get to sneak in a few episodes of New Girl or Friends at night to wind down. SW: When you're not working or rehearsing what's your favorite neighborhood to explore? KZ: My favorite neighborhood has to be the South End because of all the amazing locally owned shops and restaurants and the true neighborhood vibe. However, lately I've been spending more time in Beacon Hill and Central Square and am having a lot of fun finding my new favorite cafes and hangouts! Follow along with Kelsey and her adventures on and off the field on Instagram @KelseyZimmerer!